Arya Samaj (Sanskrit ārya samāja आर्य समाज "Noble Society" Hindi आर्य समाज, Bengali আর্য সমাজ, Punjabi ਆਰੀਆ ਸਮਾਜ, Gujarati આર્ય સમાજ) is an Indian religious movement that promotes values and practices based on the infallibility of the Vedas. The sect was founded by Swami Dayananda, a sannyasi, on 7 April 1875. It was established in Bombay on 7 April 1875 by Dayanand Saraswati but others note that he was in Ludhiana in April 1877 and say that the formal founding took place at Lahore on 24 June 1877 when it became more than just a regional movement based in Punjab. Between 1869 and 1873,Swamy Dayanand Saraswati (origanally called Mul Shankar), a native of Gujarat from the Kathiawar region, made his first attempt at reform in India towards orthodox Hinduism. This attempt took the form of the establishment of "Vedic Schools" or "Gurukuls" which put an emphasis on Vedic values, culture, and religion or satya sanatan Dharma to its students including boys and girls separately as on ancient Vedic pattern. The first was established at Farrukhabad in 1869 with 50 students enrolled in its first year. This initial success led to the founding of four additional gurukuls in rapid succession at Mirzapur (1870), Kasganj (1870), Chhalesar (Aligarh) (1870) and Varanasi (1873) - all now in Uttar Pradesh. 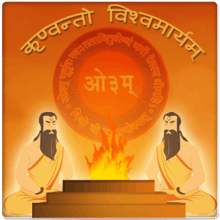 The Vedic Schools represented the first practical application of Dayanand's vision of religious and social reform which was based on Vedic tradition. They enjoyed a mixed reception. On the one hand, students were not allowed to perform traditional idol worship of stone sculpture (murti puja in Hindi) at the Gurukul, and were instead expected to perform sandhya (a form of meditative prayer using vedic mantras with divine sound and pronunciation from the Vedas) and participate in agnihotra twice daily in morning. Disciplinary action was swift and not infrequently severe. On the other hand, all meals, lodging, clothing and books were given to the students free of charge, and the study of Sanskrit Holy books like Vedas, Upnishadas, Aranyakas, Kashika, Nirukta, Mahabhashya, Ashtadhyayi, Darshanas were opened to non-Brahmins and also for women. The most noteworthy feature of the Gurukuls was that only those texts which accepted the authority of the Vedas were to be taught. This was critical for the spiritual and social regeneration of Vedic culture in India. The Vedic Schools soon ran into difficulties. Dayanand had trouble finding qualified teachers who agreed with his views on religious reform, and there existed a paucity of textbooks which he considered suitable for instruction in Vedic culture. Funding was sporadic, attendance fluctuated considerably, and tangible results in the way of noteworthy student achievement were not forthcoming. Consequentially, some of the schools were forced to close shortly after opening. As early as 1874, it had become clear to Dayanand that, without a wide and solid base of support among the public, setting up schools with the goal of imparting a Vedic education would prove to be an impossible task. He therefore decided to invest the greater part of his resources in the formulation and propagation of his ideology of reform. Deprived of the full attention of Dayanand, the Gurukul/Vedic School system collapsed and the last of the schools (Farrukhabad) was closed down in 1876. After the spread of Arya Samaj in the twentieth century, more than 200 Vedic schools are currently run by DAV organisation. While traveling (1872–1873), Dayananda came to know of several of the pro-Western Indian intellectuals of the age, including Navin Chandra Roy, Rajnarayan Basu, Debendranath Tagore and Hemendranath Tagore all of whom were actively involved in the Brahmo Samaj. This reform organization, founded in 1828, held many views similar to those of Dayanand in matters both religious (e.g., a belief in monotheism and the eternality of the soul) and social (e.g., the need to abolish the hereditary caste or varna system and uplift the masses through education). Debendranath Tagore had written a book entitled Brahmo Dharma, which serves as a manual of religion and ethics to the members of that society, and Dayanand had read it while in Calcutta. Although Dayanand was persuaded on more than one occasion to join the Brahmo Samaj, there existed points of contention which he could not overlook, the most important being the position of the Vedas. Dayanand held the Vedas to be divine revelation, and refused to accept any suggestions to the contrary. Despite this difference of opinion, however, it seems that the members of the Brahmo Samaj parted with Dayanand on good terms, the former having publicly praised the latter's visit to Calcutta in several journals. Dayanand made several changes in his approach to the work of reforming Hindu society after having visited Calcutta. The most significant of these changes was that he began lecturing in Hindi. Prior to his tour of Bengal, he had always held his discourses and debates in Sanskrit. While this gained him a certain degree of respect among both the learned and the common people, it prevented him from spreading his message to the broader masses. The change to Hindi allowed him to attract increasingly larger following, and as a result his ideas of reform began to circulate among the lower classes of society as well. After hearing some of Dayanand's speeches delivered in Hindi at Varanasi, Raj Jaikishen Das, a native government official there, suggested that Dayanand publish his ideas in a book so that they might be distributed among the public. Witnessing the slow collapse of the gurukuls/Vedic Schools due to a lack of a clear statement of purpose and the resultant flagging public support, Dayanand recognized the potential contained in Das's suggestion and took immediate action. From June to September 1874, Dayanand dictated a comprehensive series of lectures to his scribe, Pundit Bhimsen Sharma, which dealt with his views and beliefs regarding a wide range of subjects including God, the Vedas, Dharma, the soul, science, philosophy, child rearing, education, government and the possible future of both India and the world. The resulting manuscript was published under the title Satyarth Prakash or The Light of Meaning of Truth in 1875 at Varanasi. This voluminous work would prove to play a central role in the establishment and later growth of the organization which would come to be known as the Arya Samaj. While the manuscript of the "Satyarth Prakash" was being edited at Varanasi, Dayanand received an invitation to travel to Bombay in order to conduct a debate with some representatives of the Vallabhacharya sect. Dayanand arrived in Bombay on 20 October 1874. The debate, though greatly publicized, never materialized. Nonetheless, two members of the Prarthana Samaj approached Dayanand and invited him to deliver a few lectures at one of their gatherings, which were received with appreciation by all those present. The members of the Prarthana Samaj of Bombay recognized in Dayanand, an individual in possession of the knowledge and skills necessary for promoting their aims, the greatest and most comprehensive of which being the general uplift of Hindu society at large and its protection from what they perceived to be the advancing threat of Christian and Muslim efforts to convert Hindus. After his having spent over a month at Bombay, 60 new-found students of Dayanand – among them, prominent members of the Prarthana Samaj – proposed the notion of founding a "New Samaj" with Dayanand's ideas serving as its spiritual and intellectual basis. After having received a personal invitation from Gopalrao Hari Deshmukh, Dayanand left Bombay and travelled to Ahmedabad, Gujarat, arriving on 11 December 1874. Once there, he conducted a debate with local pundits on the issue of Vedic authority, and emerged victorious. It is reported that the formation of a Samaj and the founding of a Vedic School at Ahmedabad were proposed following the success of the debate, yet not enough support for such a venture could be mustered. On an invitation from Hargovind Das Dvarkadas, the secretary of the local Prarthana Samaj, Dayanand traveled to Rajkot, Gujarat, arriving on 31 December 1874. Instead of delivering his standard program of lectures, he allowed members of the audience to choose the topics they would like to have him discourse upon. A total of eight topics were chosen, and Dayanand delivered impromptu lectures on all of them to the satisfaction of all present. Gifts were bestowed upon him as tokens of gratitude for his masterly orations, and it was announced that the Rajkot Prarthana Samaj was henceforth dissolved and was ready to be reorganized as a new Samaj under the auspices of Dayanand. After much deliberation he chose the name ‘Arya Samaj’ or ‘Society of Nobles’. Dayanand drafted a list of 28 rules and regulations for the Rajkot Arya Samaj, which he later had printed for distribution. On his way back to Bombay, Dayanand stopped off in Ahmedabad and related the news of Rajkot, Gujarat, distributing copies of the rules and regulations to those present. A meeting was held on 27 January 1875 to discuss the proposal of forming an Arya Samaj there, yet no conclusive decision was reached. Unwilling to wait for the deliberations to come to an end, Dayanand continued on his way to Bombay. While travelling, he received word that the still fragile Rajkot Arya Samaj had involved itself in some political dispute that resulted in a government warning issued against it and its members. Thus, the collapse of the just established society was already looming large. "A meeting of the Arya Samāj for investing boys with the sacred thread" from R. V. Russell's 1916 The Tribes and Castes of the Central Provinces of India--Volume I.
Dayanand Saraswati came to Bombay and immediately the appeal to establish an Arya Samaj there was renewed. However, he did not want a protracted debate to ensue as had occurred at Ahmedabad, bringing with it the possibility of endless deliberations. Thus, a membership drive was initiated which would circumvent the need for discussions. Within a short time, 100 individuals enrolled themselves as prospective members. On 7 April 1875, the Bombay Arya Samaj was officially established. The membership amounted to 100 persons, including Dayanand. The members appealed to him that he should serve as either the President or the Guru of the Samaj, but he refused, requesting instead that he be listed as a regular member. From there onwards Arya Samaj Sect steadily grew in numbers. Dayanand died in 1883. Arya Samaj grew after his death, mainly in Punjab. Early leaders of the Samaj were Pandit Lekh Ram and Lala Munshi Ram (better known as Swami Shraddhanand after his Sanyas). The activities and the opposition Arya Samaj encountered in Punjab was credited with the formation of the rival Sikh dominated Singh Sabha, the forerunner of the Akali Dal. Some authors also claim that the activities of Samaj led to increased antagonism between Muslims and Hindus. Shraddhanand led the Shuddhi movement that worked towards bringing Converted Hindus back into the fold. Arya Samaj split into two in Punjab after 1893 on the question of eating meat. The group that refrained from meat was called the Mahatma group and the one favoring consumption of meat as the "Cultured Party". During the early parts of the 20th century, the Samaj established chapters in British colonies where there was a sizeable Indian diaspora such as South Africa, Surinam and Guyana. Prominent Indian Nationalists such as Lala Lajpat Rai belonged to Arya Samaj and were active in propagating the message of Samaj. Arya Samaj was and is an important sect amongst Punjabi Hindus. Pandit Lekh Ram (1858 – 6 March 1897) was an important Arya Samaj Hindu leader. He is famous for his encounters with the founder of the Ahmadiyya Muslim Community Mirza Ghulam Ahmad. He also wrote a book in falsification of Ahmad's Barahin-e-Ahmadiyya and named it Takzeeb e Barahin Ahmadiyya (A falsification of the Barahin e Ahmadiyya). He was assassinated on March 6, 1897. Members of the Ahmadiyya Muslim Community claim that this was in accordance with the prophecies of Mirza Ghulam Ahmad. Arya Samaj promoted the use of Hindi and discouraged the use of Punjabi language in Punjab. This was a serious point of difference between the Sikhs represented by the Akalis and the Arya samaj during the period immediately following Indian independence and the demand for a Punjabi speaking state. Arya Samaj was notable for its donation. After the 1905 Kangra earthquake, large amount of donations had been made by Arya Samaj in relatively small period, which was largely appreciated by the afflicted population. Other humanitarian missions of the organization included the support for women's right to vote, and protection for widows. Today, temples set up by Arya Samaj are found all over India. The organization also has played an important role in spread of education through its network of schools known by name of Dayanand Anglo Vedic (DAV) schools in India. There are many arya samaj mandir in Delhi. More than 200 Vedic Schools or Gurukuls are running on that method. Arya Samaj Helpline is working for the Gurukuls reforms. The Samaj is also present in countries such as Guyana, Surinam, Australia, South Africa, Kenya, Mauritius and other countries where a significant Hindu diaspora is present. Immigrants to Canada from East Africa and the Caribbean countries respectively form separate Arya Samaj communities in many Canadian cities including Toronto. Most major metropolitan areas of United States have chapters of Arya Samaj. There are many arya samaj mandir in Delhi. Some of them are government authorized for conducting wedding ceremonies. 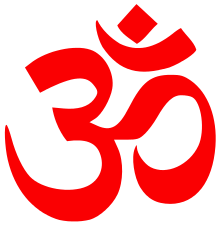 ओ३म् O3m (Aum), considered by the Arya Samaj to be the highest and most proper name of God. Rejection of other Hindu religious books in the sense that they are stories to reinforce Vedic knowledge and may not be revealed by a Supreme Being. Most of these books like the Ramayana and Mahabharata are legends of historical figures, which the other and now mainstream branch of Hinduism, the Sanatana Dharma, has made into gods and avatars. Rejection of scriptures of other religions like the Bible, Quran, etc. Arya Samaj in regions outside of India (i.e. Caribbean) with immigration during the 1800s and the 1900s have sustained religious beliefs that more closely follows the teachings of Dayanand Sarastwati. .
Dayananda emphasised the ideals of brahmacharya (chastity) for priests. The main religious practice of the Arya Samaj include a havan (fire altar) where the Gayatri Mantra is recited. Arya Samaj promotes personal worship of God, where havans can be performed without the need of a priest. Main holidays include Holi, celebration of the start of spring and Diwali, a celebration of harvest and the victory of good over evil. Some Arya samajis are lacto-vegetarian. Eating of beef is avoided. This is different from the Sanatan Dharma, which worships the cow as a mother goddess. In the Arya Samaj, the cow is seen as an animal that provided livelihood to Indian farmers and they were respected, just as the horse was a significant animal for other cultures in Europe. Beef eating is not prohibited per se, but is avoided given its significance in giving rise to the Indian civilization. Arya Samajis revere nature elements as a manifestation of god and or universe and is the closest existing religion to the proto Indo-European religion. Many Vedic gods (God as in Devata's, that aspect of God that give life or create etc., not as God in Abrahamic Religion) are similar to that of the Greek and Norse pantheon of gods, however Vedic religion predates these cultures. Dia with two wicks, pointing in each direction (N,W,S,E). The Arya Samaj branch in Suriname celebrates Diwali as the victory of good over evil. On this day, they keep fast on vegetarian food and oil lamps are lighted while chanting the Gayatri Mantra. Practice is to keep one lamp, which is of larger size with two wicks in opposing direction forming a cross while the other lamp have one wick. The larger lamp as a result has four candle lights in each direction (N,W,S,E) while the others have one. The largerlamp is lit first and other dias are only lit after recitation of the Gayatri Mantra has concluded. The recitation of the Gayatri Mantra occurs in front of a fire altar lit with sandalwood. A lamp kept in every room except the bathroom and restroom. More lamps can be lit, which can be placed arbitrarily in the yard, living room, etc. Holi is celebrated as the conclusion of winter and the start of spring to sow the land and hope for a good harvest. This day is marked by colors and song (Chautal). It does not require specific prayer or fasting, however some people keep a vegetarian fast on this day. Chautal includes songs relating to lord (i.e. significant person, not god or avatar) Rama and his return to Ayodhia, but not in the sense that they are religious prayer but stories of a historical person turned into a legend, as are many gods in the Sanatana Dharma branch of Hinduism. ↑ Hastings, James; John A. Selbie (Ed.) (2003). Encyclopedia of Religion and Ethics, Part 3. Kessinger Publishing. p. 57. ISBN 0-7661-3671-X. ↑ Jones, Kenneth W. (May 1973). "Ham Hindū Nahīn*: Arya Sikh Relations, 1877–1905". The Journal of Asian Studies. 32 (03): 457–475. doi:10.2307/2052684. ↑ Barrier, Norman (May 1967). "The Arya Samaj and Congress Politics in the Punjab, 1894–1908". The Journal of Asian Studies. 26 (03): 363–379. doi:10.2307/2051414. Retrieved 1 October 2014. ↑ Nair, Neeti (2011). CHANGING HOMELANDS: HINDU POLITICS AND THE PARTITION OF INDIA. New Delhi: Permanent Black. p. 53. ↑ "Punjab". Imperial Gazetteer of India. 20: 291. 1909. Retrieved 2 October 2014. ↑ Rajivlochan, M., & Rajivlochan, M. (2014). Coping with Exclusions the Non-Political Way. Mapping Social Exclusion in India: Caste, Religion and Borderlands, 82-83. ↑ Kishwar, Madhu (April 26, 1986). "Arya Samaj and Women's Education: Kanya Mahavidyalaya, Jalandhar". Economic and Political Weekly. 21 (17): 9. doi:10.2307/4375593. ↑ Rai, L. L. (1915). The Arya Samaj: An Account of its Aims, Doctrine and Activities, with a Biographical Sketch of the Founder. London: Longman. ISBN 978-81-85047-77-5. ↑ Ian Talbot writes : "Relations grew particularly bad between the Aryas and the Muslims. Serious violence broke out in 1897 when Pandit Lekh Ram was assassinated. Lekh Ram's greatest influence was in the north-west of Punjab. He had in fact joined the Peshawar Arya Samaj in 1880 and rose to prominence first as a missionary and then as editor of the Arya Gazette. At first he had limited his attacks to the Ahmadi movement of Mirza Ghulam Ahmad, but he increasingly attacked orthodox Muslims as well. His pamphlet, Risala-i-Jihad ya'ri Din-i-Muhammad ki Bunyad (A Treatise on waging holy war, or the foundation of the Muhammadan Religion) caused a considerable outcry, when it was published in 1892. Until his murder by a Muslim five years later, Lekh Ram continued to stir up animosity by his vituperative writings." (Punjab and the Raj, 1849–1947", p. 72–73) Ian Talbot. ↑ Lal, Vinay; Goolam Vahed (2013). "Hinduism in South Africa: Caste, Ethnicity, and Invented Traditions, 1860-Present" (PDF). J Sociology Soc Anth. 4 (1-2): 1–15. ↑ Ombongi, Kenneth Samson (1993). Hindu socio-religious organizations in Kenya: a case study of Arya Samaj, 1903-1978. University of Nairobi. ↑ Eisenlohr, Patrick. Little India: Diaspora, Time, and Ethnolinguistic Belonging in Hindu Mauritius. Berkeley, California: University of California Press. p. 36. ISBN 978-0-520-24879-3. ↑ Coward, Harold (1999). Hindus in Canada, The Third National Metropolis Conference (PDF). Vancouver, Canada: Vancouver Center of Excellence. p. 8. ↑ "Arya Pratinidhi Sabha America". Retrieved 30 December 2013. J.T.F. Jordens, Dayanada Saraswati, Delhi: Oxford University Press (1978). Lajpat Rai, The Arya Samaj: An Account of its Aims, Doctrine and Activities, with a Biographical Sketch of the Founder, D.A.V. College Managing Committee, New Delhi (1915), ISBN 978-81-85047-77-5. J.M. Sharma, Swami Dayanand: A Biography, USB Publishers Distributors Ltd., India (1998), ISBN 81-7476-212-4. The Origin, Scope and Mission of the Arya Samaj, by Ganga Prasad Upadhyaya. Published by Arya Samaj, 1954. The Arya Samaj: , by Vaidyanath Shastri. Published by Sarvadeshik Arya Pratinidhi Sabha, 1967. The Arya Samaj and Indian Nationalism, 1875–1920, by Dhanpati Pandey. Published by S. Chand, 1972. A Critical Study of the Contribution of the Arya Samaj to Indian Education, by Saraswati Shantipriya Pandit. Published by Sarvadeshik Arya, Pratinidhi Sabha, 1975. Arya Samaj and Indians Abroad, by Nardev Vedalankar, Manohar Somera. Published by Sarvadeshik Arya Pratinidhi Sabha, 1975. The Arya Samaj: Hindu Without Hinduism, by D. Vable. Published by Vikas, 1983. ISBN 0-7069-2131-3. Social Movements and Social Change: A Study of Arya Samaj and Untouchables in Punjab, by Satish Kumar Sharma. Published by B.R. Publishing, 1985. Arya Samaj and the Freedom Movement: 1875–1918, by Kripal Chandra Yadav, Krishan Singh Arya. Manohar Publications, 1988. ISBN 81-85054-42-8. Arya Samaj Movement in India, 1875–1947, by Gulshan Swarup Saxena. Published by Commonwealth Publishers, 1990. ISBN 81-7169-045-9. Hinduism Today by R. M. Chopra, 2009. Aryasamaj Ke Stambh', Aryasamaj ke Stambh by Arya Samaj Jamnagar, Divyang Pandya. ↑ Arya Dharm: Hindu Consciousness in 19th-Century Punjab Paperback – January 1, 2006 Jones, Kenneth W. (1976). Arya dharm : Hindu consciousness in 19th-century Punjab. New Delhi: Manohar. ISBN 978-8173047091. Retrieved 30 November 2016.